An interesting way to start a marketing book, eh? 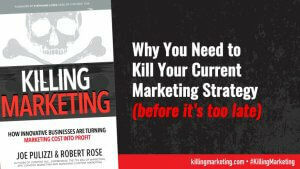 I just finished a fascinating new book, Killing Marketing: How Innovative Businesses are Turning Marketing Cost into Profit, by Joe Pulizzi and Robert Rose. Joe and Robert are the creators of the mega-conference Content Marketing World, and Joe has written other books like Content Inc, Epic Content Marketing, and Managing Content Marketing. The core message of their new book is acknowledging that the marketing world, as we have known it since the dawn of the big three (print, radio, and TV), is our past and that marketing doesn’t have to be just a cost center anymore. When done well – brands can actually create a profit center from their marketing efforts. Instead of your marketing requiring additional financial resources – what if it generated new dollars? We’ve all heard the idea that about brands should become media companies. You may not want to take your company quite that far. But wouldn’t you like to make money with your marketing efforts? Traditional marketing has been primarily advertising – the renting of space on someone else’s channel to earn attention, brand awareness and alter the consumer’s behavior. Even PR falls under that description. Instead of buying an ad, the brand or their agency would pitch their story to the editorial side of the advertising channels. Their goal was to have a story written about them or their offerings that would create the same results as paid advertising would have generated. Along came the Internet and suddenly consumers found their voice. Until that shift, they’d been our silent audience. But as it became easier to share opinions on message boards, forums, social media channels, websites and review outlets, they got louder and louder. Initially as a defensive mechanism, brands because using the Internet too – creating content to fight for search engine position and to balance the consumers’ voice. But the brands discovered what probably seems to you as a very simple marketing truth. That when the brands provided valuable content and helpful information, the consumers would create a connection and magnify the brand’s reach by sharing the content and inviting others in. On a mega-level, this is what Johnson & Johnson has done with BabyCenter.com. What started as a simple extension of their core website, it now reaches more than 45 million parents a month across the globe and offers their content in nine different languages. Eight of every ten U.S. mothers use BabyCenter.com. Odds are your goals aren’t quite so lofty. Which is awesome because that means you can replicate your version of the results faster and with a smaller level of investment. The Internet and digital content have leveled the playing field. It’s why small brands like BigPoppaSmokers.com have crushed their competition, stolen the market share of much bigger companies and have created a brand that garners incredible amplification of their value from the consumers who love them. The book isn’t suggesting that you abandon your core business model and become an organization that generates revenue the way a traditional media company does. Nor is it suggesting that you should abandon your paid and earned media efforts. For most organizations, there will always be a benefit to those channels. But what the authors are suggesting is that businesses today also need a profit-generating owned media strategy that will give you an unfair competitive advantage. Many people may quickly get to the idea that because it gets easier and cheaper to publish content and we have more and more places to put it – that the value of content will be diminished as the volume increases. If we’re talking about generic content that any business in your industry could produce as easily as you could – that’s probably true. No one needs one more article of benign content that doesn’t take a position, challenge a stall belief or actually go out of its way to be helpful to the audience. It’s why Google changed their algorithm to reward “quality content” and the channels (like Facebook) changed their game so that brands had to buy eyeballs, even if they were sharing something of value. So now the outlets that we were counting on to leverage our content began to behave like a traditional media channel. Which is why so many companies have decided that the only way to control the delivery was to control the channel. And voila…they decided to stop competing on a playing field they didn’t control and instead, they became the channel. Now, instead of relying on paid and earned media to drive people to make a purchase, the goal is to use those channels to drive the audience to your own content where you can add value immediately so that on the day they actually need to buy the thing you sell – you’re the obvious choice. The book goes on to outline how a traditional company, who has been marketing in more traditional ways, can turn their marketing focus/efforts on its side and come out with a model of generating revenue from their marketing efforts. I can remember being in an advertising class (so you know how long ago that was) and the professor was talking about the value of brand equity. He explained that Coca Cola was a publicly traded company and so they had to publish their financials. He put up a slide that showed that the company determined the value of their brand was in excess of a few billion dollars. With a B. In 2013 – the value was $79.2 billion dollars. What happens when you go beyond the brand and create something like BabyCenter.com? Now you have a tangible asset that subsidizes the growth of your company and audience. Interesting stuff, eh? And I am just scratching the surface of the book. It goes on to walk you through how to think differently about your marketing and begin to re-tool your efforts to this new model. As with anything Joe and Robert do – I’m a fan. I think they’re insightful thinkers who have walked out what they teach (check out the Content Marketing Institute site) and continue to refine their viewpoint as things evolve. Check out the book. Re-think your plan for 2018. Begin to build your channel and the equity it can bring your organization. I wanted to buy this product for the marketing aim! Thanks!